Made to Stand Up As A Trophy Display on a Shelf. Trophy Case or Your Trainers, Family etc.! IFB Makes Custom Brass Center Medallion Designed Belts for ANYTHING! 1 Time Fee: Artwork for your Medallion $150.00. 1 Time Fee: Medallion Mold charge: $150.00. 1 Time Fees of $300.00. The fee for this Medallion to be Poored, Polished & Painted is $100.00. Once you have your Medallion Mold done (First Time Fees Above) your fees will be as shown below. 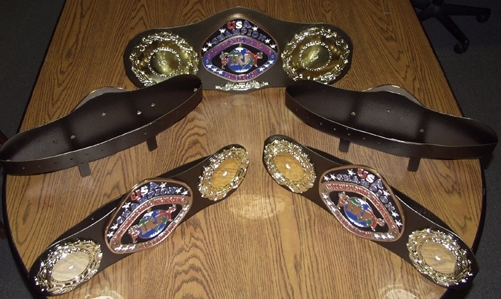 A Great Way to Display Your IFB "REAL" Leather Championship Belt. IFB Championship Belt. A MUST for ALL IFB Championship Belt Winners! Belt stands can come in any color.